FAO Director-General Jose Graziano Da Silva (right) and Walt MacNee, Vice Chairman, MasterCard Worldwide sign new partnership agreement. Residents at the Kakuma refugee camp in north-western Kenya will soon be able to buy charcoal produced in an environmentally-friendly way by local farmers as part of an innovative new alliance between the United Nations Food and Agriculture Organization (FAO) and MasterCard to support small farmers and poor families. “FAO is extremely proud of this collaboration with MasterCard that will support small-scale farmers to become economically independent by advancing financial inclusion,” said FAO Director-General José Graziano da Silva. A new partnership agreement, signed today by the FAO Director-General and Walt Macnee, Vice Chairman of MasterCard, at FAO headquarters in Rome, paves the way for a collaborative effort that will develop inclusive payment systems to support small-scale farmers and poor families, the agency said in an announcement. The project “is designed to improve incomes of Turkana residents, reduce social tensions between those residents and the refugees, and relieve pressure on the environment,” the agency said. According to the UN refugee agency, Kakuma camp is a melting pot of refugees from more than 20 countries. The majority are from South Sudan, Somalia, Sudan and the Democratic Republic of the Congo. The town of Kakuma has hosted the camp since 1992. FAO’s three main goals are: the eradication of hunger, food insecurity and malnutrition; the elimination of poverty and the driving forward of economic and social progress for all; and, the sustainable management and utilization of natural resources, including land, water, air, climate and genetic resources for the benefit of present and future generations. 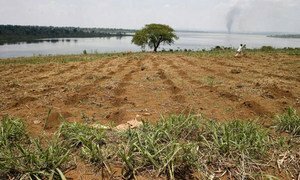 At the start of the World Water Week conference in Stockholm, Sweden, the United Nations agriculture agency today announced that it would develop a new open-access data portal that uses satellite imagery to provide insights into more efficient and productive use of agricultural waters – helping water-scarce countries in the Near East and North Africa better manage the resource.